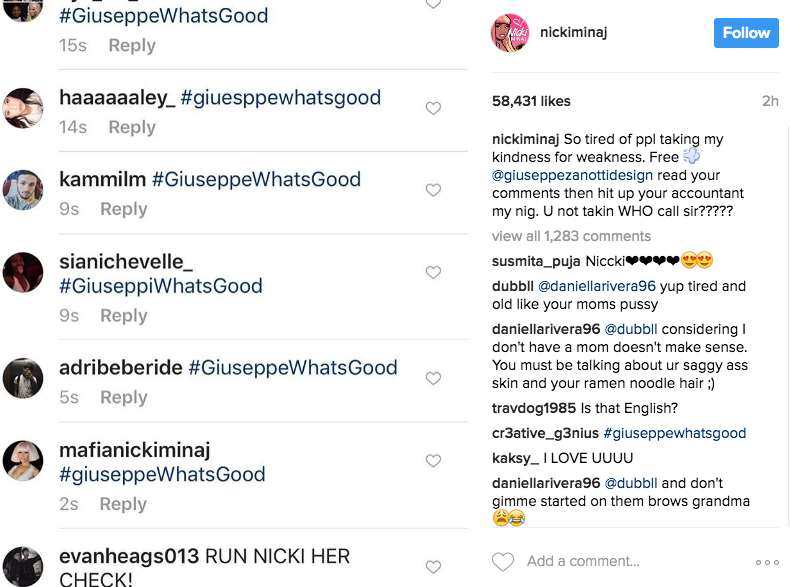 Nicki Minaj certainly isn’t blowing any kisses Giuseppe Zanotti’s way anymore. The pop star tore into the shoe designer on social media, because his American publicity team refused a meeting with her to discuss designing a capsule shoe collection. 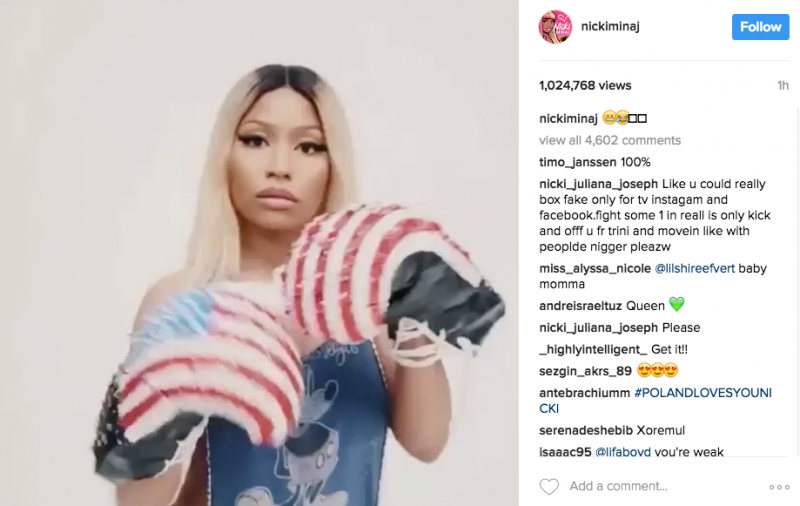 Minaj has been a longtime client and supporter of the brand and the designer even has a sneaker named the “Nicki” (see below on @nickiminaj). “Dear @giuseppezanottidesign #RunMeMyCHECK your PR must’ve fell & bumped their head when they told my agency they weren’t discussing anything with us. I’m giving you 24 hours. 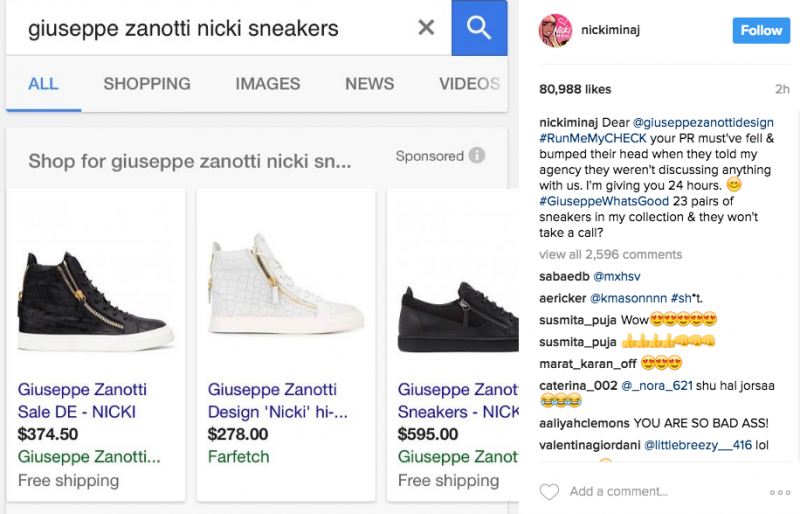 #GiuseppeWhatsGood 23 pairs of sneakers in my collection & they won’t take a call?” Minaj posted on Instagram. Since the star took to social media, the hashtag #WhatsGoodGiuseppe has already gone viral and that one post alone has 80,988 likes (as of the time we posted this). And if blasting the designer to her 73.1 million Instagram follower and her 20.7 million Twitter followers wasn’t enough, Minaj is currently in the recording studio (for her app game Nicki Minaj: The Empire according to her Instagram)…stay tuned!